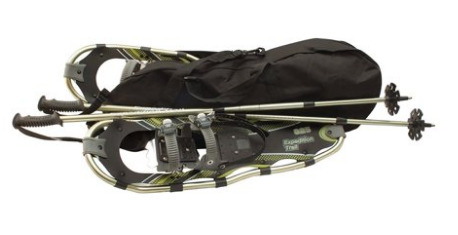 Ultimate Snow Shoe Kit - Premium Shoe, Lightweight Trek Poles, Ballistic Nylon Carry Bag. These lighter, stronger snowshoes are ideal for any snow condition. New features add strength, reliability and convenience. An improved hytrail polyurethane asymmetric molded harness goes on easily and provides centered walking movement. 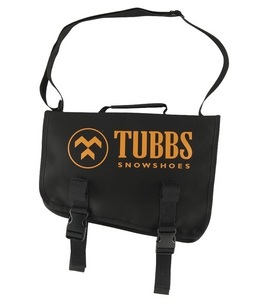 Deluxe ratchet buckles ensure a precise fit over trail shoes or insulated boots. A redesigned raised forward frame and sturdy, UV-protected olefin decking for smooth walking over deep snow. Harness and deck are flexible to minus 15°C. One-piece foot plate holds boot in place. Pivot band eases movement, while heavy-duty aluminum crampons front and back deliver traction on snow crust and ice. Lightweight T7-7075 aircraft-grade aluminum frames. One year warranty with a three year "replacement binding" warranty.